And indeed, how different is His Kingship when compared with earthly Kings. Earthly Kings are people of power and authority, often leading armies to war, for their own greater wealth and glory, often looking after themselves and their families and friends before anyone else. 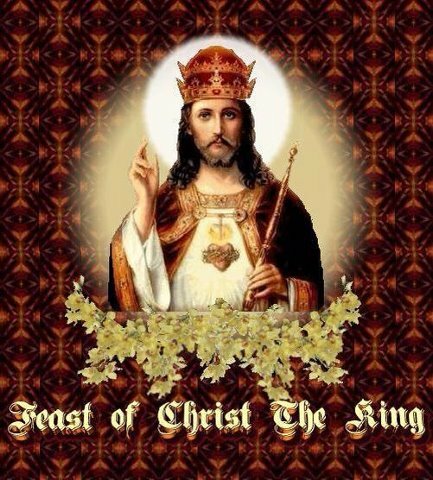 This feastday was instituted by Pope Pius XI in 1925, to bring to the attention of the troubled world at that time, that there is really only one King - the Lord and King of all. In part of his 10 page encyclical, he said, "In the first encyclical letter which We addressed at the beginning of Our Pontificate to the Bishops of the universal Church, We referred to the chief causes of the difficulties under which man was labouring. And We remember saying that these manifold evils in the world were due to the fact that the majority of men had thrust Jesus Christ and His holy law out of their lives; that these had no place either in private affairs or in politics: and we said further, that as long as individuals and states refused to submit to the rule of Our Saviour, there would be no really hopeful prospect of a lasting peace among nations. Men must look for the peace of Christ in the Kingdom of Christ........."
"Moreover since this Jubilee marks the sixteenth centenary of the Council of Nicaea, We command that event to be celebrated, and We have done so in the Vatican Basilica. There is a special reason for this, in that the Nicene Synod defined and proposed for Catholic belief the dogma of the Consubstantiality of the Onlybegotten with the Father, and added to the Creed the words, "of whose Kingdom there shall be no end. ", thereby affirming the kingly dignity of Christ." Today we remember the charity and love which Jesus has for all people, and we strive to be like Him. This feastday is on the last Sunday before the beginning of Advent, therefore is a movable feast.